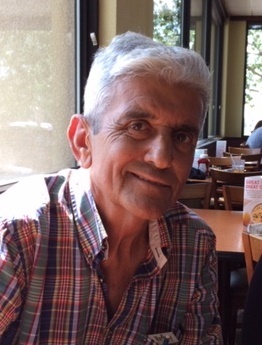 Rodolfo “Rudy” Escamilla Elizondo, Age 66 of Kenedy, TX passed away on Saturday, April 6, 2019 in Kenedy, TX. Rudy was born on November 8, 1952 in Karnes City, TX to the late Roberto, Sr. and Ofelia Escamilla Elizondo. Rudy was the owner operator of Elizondo Welding; a loving husband, father, grandfather, uncle, friend to many, a member of Our Lady Queen of Peace Catholic Church and served his country proudly in the U.S. Navy. He is preceded in death by his parents, Roberto, Sr. and Ofelia Escamilla Elizondo; brothers, Roberto Elizondo, Jr and Rolando Elizondo. He is survived by his loving wife of 42 years Rose Marie Lopez Elizondo of Kenedy; daughters, Ofelia Marie Elizondo and companion Guy Willeford, Jr. of Victoria, Vanessa Elizondo Hrbacek and husband Jeff of Universal City; granddaughter, Hannah Hrbacek and numerous nieces and nephews. A Holy Rosary will be recited Tuesday, April 9, 2019 at 7PM in the Eckols Funeral Home Chapel. Funeral Mass will be celebrated Wednesday, April 10, 2019 at 10AM at Our Lady Queen of Peace Catholic Church with the Rev. Nobert Hermann officiating. Interment with Military Honors will follow in the Sacred Heart Cemetery in Kenedy, TX. Serving as Pallbearers will be Johnnie Lopez, Luciano Benitez, Roberto Elizondo, III, Javier Villarreal, Dennis Lopez, and Reducindo Escamilla, Jr.
Honorary Pallbearers: Joe Hernandez, III, Cuatro Hernandez, Rene Villarreal, and Carlos Chapa.